In my father’s generation there was a lot of talk about “the Golden Fleece”. This symbolised the reward of a quest for education in Europe. In a sense it valorised education to mythic proportions, equating it with Jason’s exploits and achievements, all against the odds. In the same breath, alongside this talk of “the Golden Fleece” educational certificates were termed “Pali”, translated roughly to “cardboard”. This was a way of understating the value of these achievements. My father’s generation was conscious that for everyone who returned from Great Britain with a degree in law, medicine, or accountancy, many more had failed in their quest. As it used to be said, they had become “lost” in England. This reference to “lost” was symbolic of the profound sense of tragedy that the idea of permanent severance from the ancestral land carried with it. Neither the English words “lost” or “missing” come close to transmitting the sorrow in the Yoruba word “sonù” when used in relation to a person. I never quite understood the term “Golden Fleece”. Our goats and cattle had “hides” not “Fleece”. And “Golden Hide” does not have quite the same ring to it. Much like I never understood words like “paddock” or “meadow”. It is obvious that a language develops to describe things in the practical world and when imported to serve in a different climate and place, it fails surprisingly, perhaps not so surprisingly, in unpredictable ways. 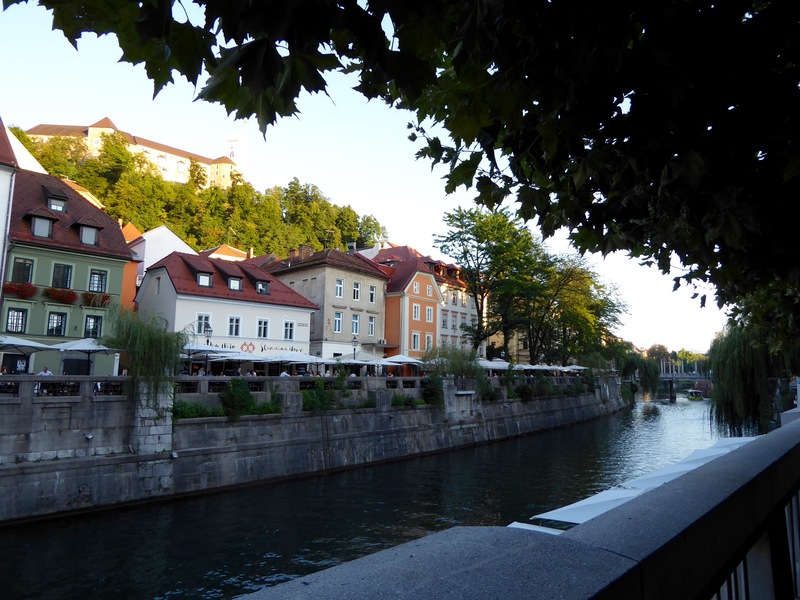 I was enthralled by the traition that Ljubljana is said to have been founded by Jason of Jason and the Argonauts. 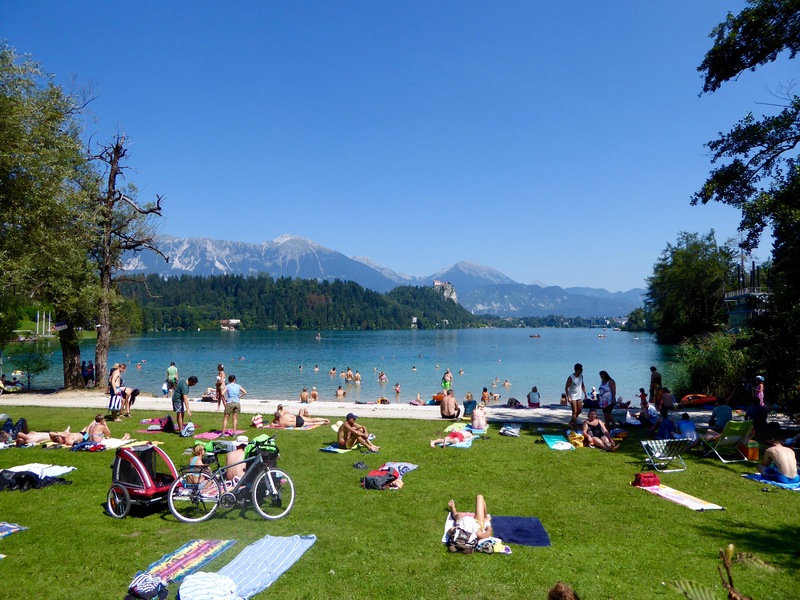 And Bled is thought to be the site of Troy. Hence my mind’s turning to memories of “The Golden Fleece” and its associations. The Jason of my adult life is the Jason who is Medea’s husband. His exploits and achievements are blotted out by his treatment of Medea even if her murder of her sons in an attempt to spite him is horrifying and unjustifiable. As for Troy it is Agamemnon’s return to Ithaca and his subsequent murder by Clytemnestra that stand out for me. A marginal note on how memory works. 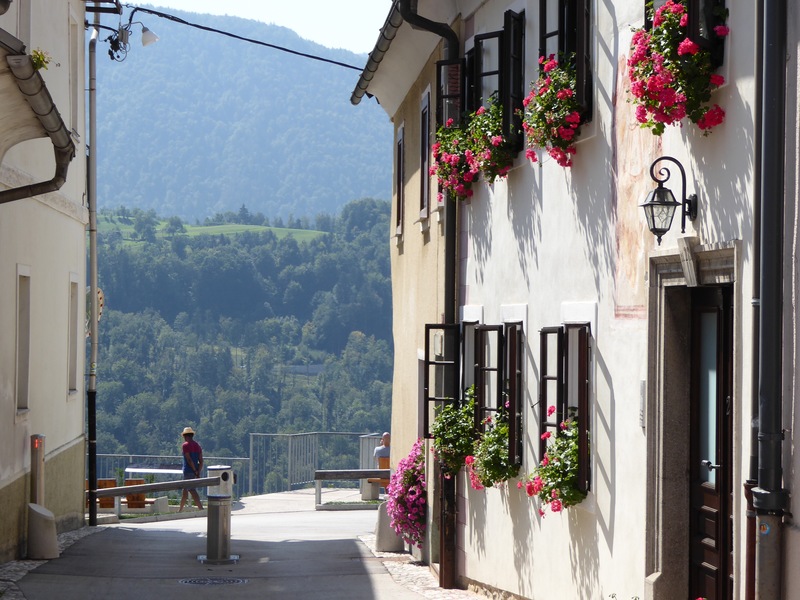 I am writing this because we have just returned from Slovenia. We had driven up from Mytholmroyd through Cragg Vale, up and up, ascending the longest uninterrupted incline in England, all the 5 -mile length of it. It was a bright late summer morning. The moorland was alight with the sun, and it wore the astonishing purple robe of heather, well not a robe but perhaps a throw laid out as if to dry in the sun. Here at the summit, the expanse of the land stretched and stretched, as if the sky and the land were expanding to infinity. Just beside the road there’s a reservoir lake glistening and lapping at the rock edge. There are no trees. We are on our way to Manchester airport to catch the plane to Slovenia. The descent from Cragg Vale through Littleborough and then Milnrow is over quickly. There was little traffic. The day before I had walked into town along Hebden Water and then back again. The rush of the river against the rocks, the breath sounds and hiss as it swivels and courses, bending and eddying was familiar yet strange. Often the river gurgled like a newborn. Along the bank Himalayan balsam thrives, outstripping the native plants and painting the air pink and sweet. The children who are usually on the improvised swing, are nowhere to be seen, as is the lone grey heron absent. You have to be further down in town to see duck dipping their beaks in the river. 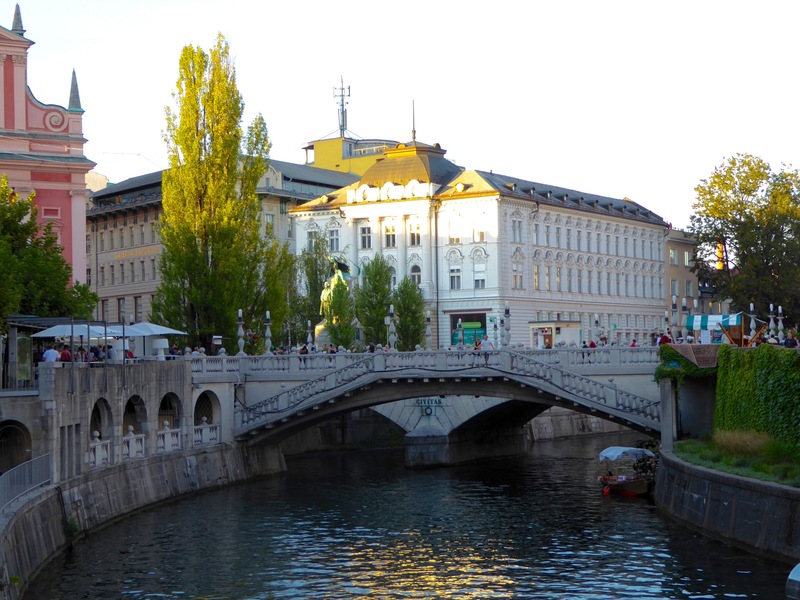 We arrived in Ljubljana in the late afternoon. We walked along the river, just before dusk. Another river in another city. The sun cast its last glow over the three bridges, burnished the roofs, hung in the air before dropping behind the house out of sight. And along the river young couples and young families paraded as the old do in Barcelona. We had dinner at a traditional restaurant: meat on wood block, mixed meat goulash and maize bread. Dry red wine and espresso for afters. Sitting in front was an American couple- the man white but his grandmother from Trieste and the woman Chinese. To one side what sounded like Australia or South African accent- one women wrinkled like prunes. Surprising, all around us were tourists, just like us. On our walk back to our hotel, Hotel Cubo, we stopped to listen to Dixie jazz played by a trio from Canada- a clarinet, bass saxophone and harmonium. For their finale they played a Russian song. It was plaintive, sorrowful yet exhilarating at the same time. Their next destination was the Ukraine. 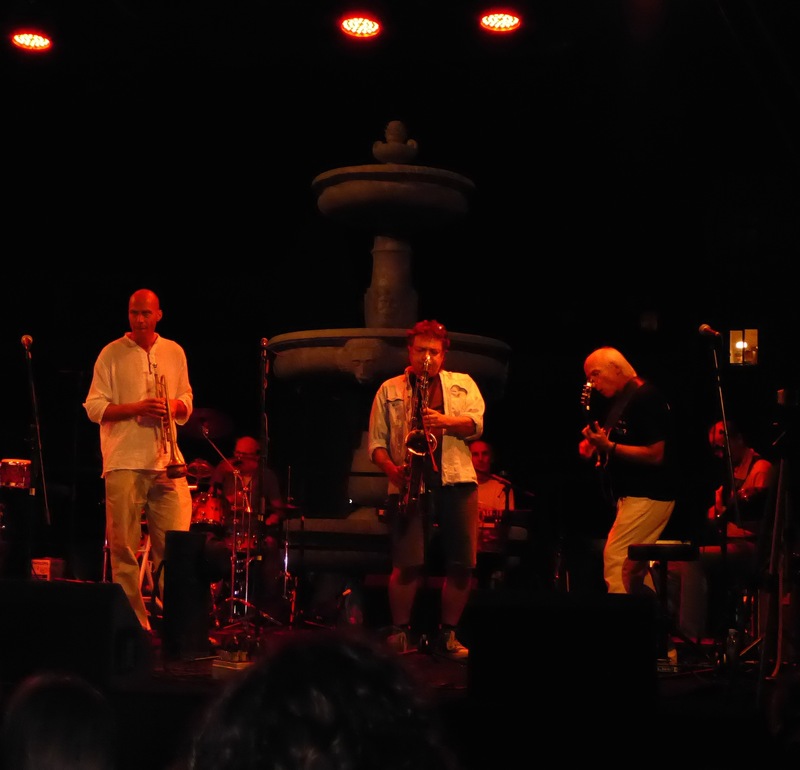 We wandered on and stopped to listen to the Kosmic orchestra play 1960s Sly and Family Stone and such like. Santana, the kind of music that I grew up with at boarding school. I suppose to the Eastern Europeans this was underground music, banned and disapproved of by the authorities, hence much valued and maybe overprized too. This like the shop window not far from our hotel was a relic of a past time. 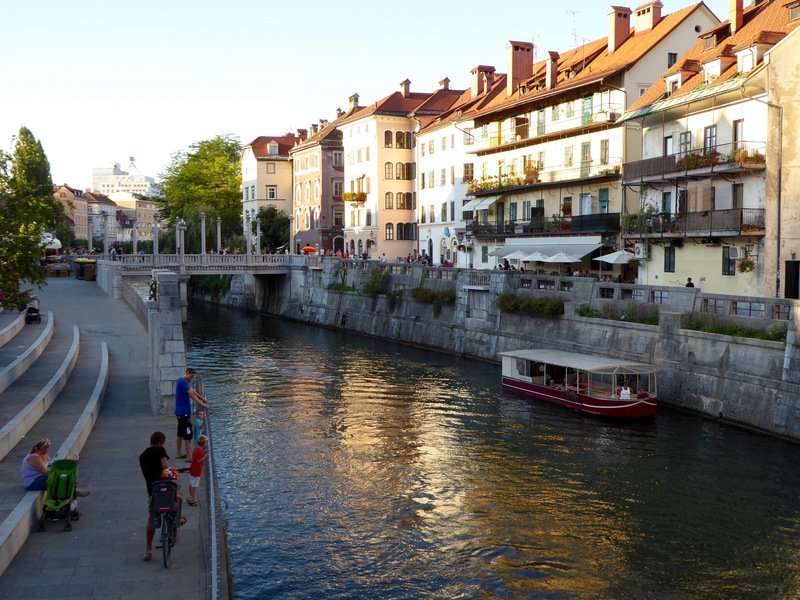 Ljubljana was a beautiful, old city, compact, romantic at night but during the day when the peeling paintwork on some poorly kept buildings were exposed to sunlight, it looked not decrepit but close. It was full moon that first night. And the moon peered out from behind the rooftops. It had a pearl-like sheen held up, there in the black impenetrable sheet of heaven, at night. 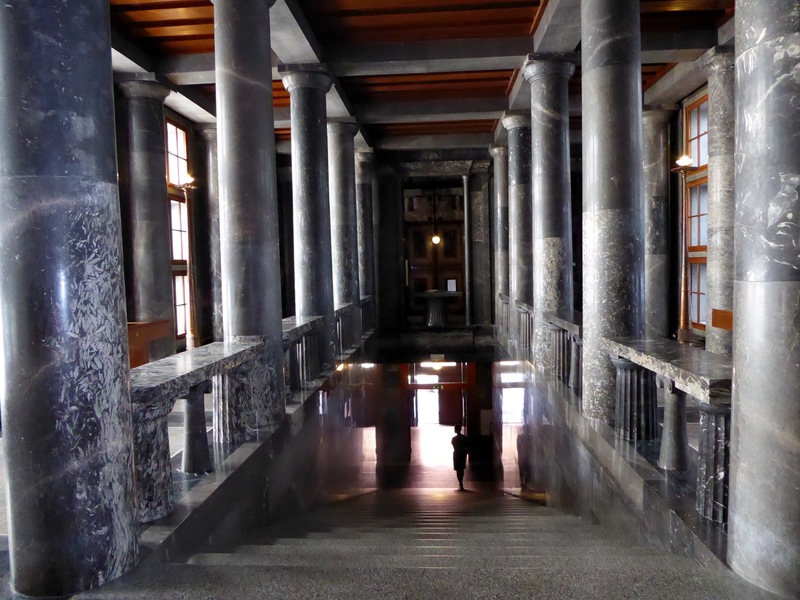 We walked back past the National & University Library, built by Plečnik in the 30s. It is clad in red brick with an armor plate of breeze blocks. The following day we discovered its magnificent interior. 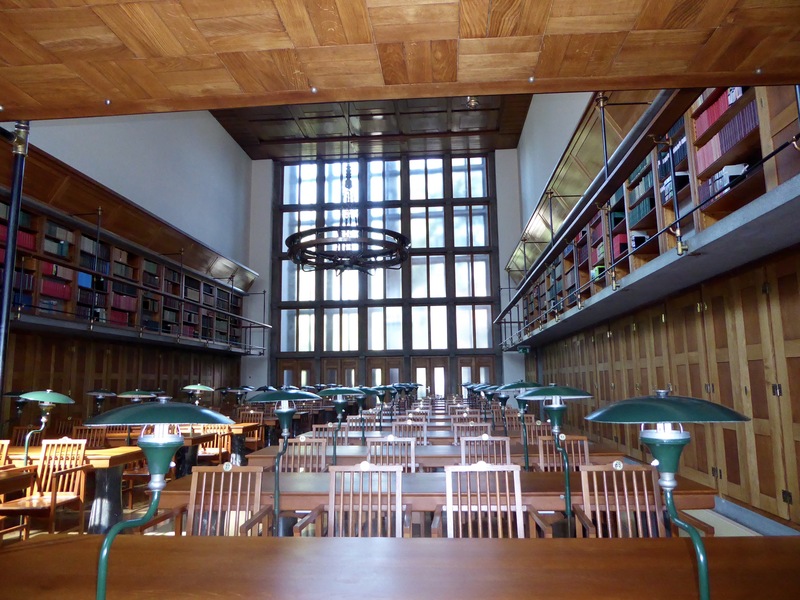 Three extraordinary chandeliers hang from the ceiling in the reading room. On Sunday we walked back to the river in the bright sunlight. Once more the city was more like the Adelphi in Liverpool, tired even fatally exhausted in places. At the Adelphi you have the magnificent chandelier overhanging the staircase. Everything else is threadbare and worn. The skirting boards scuffed, bruised and looking for loving care and attention, as estate agents would say. 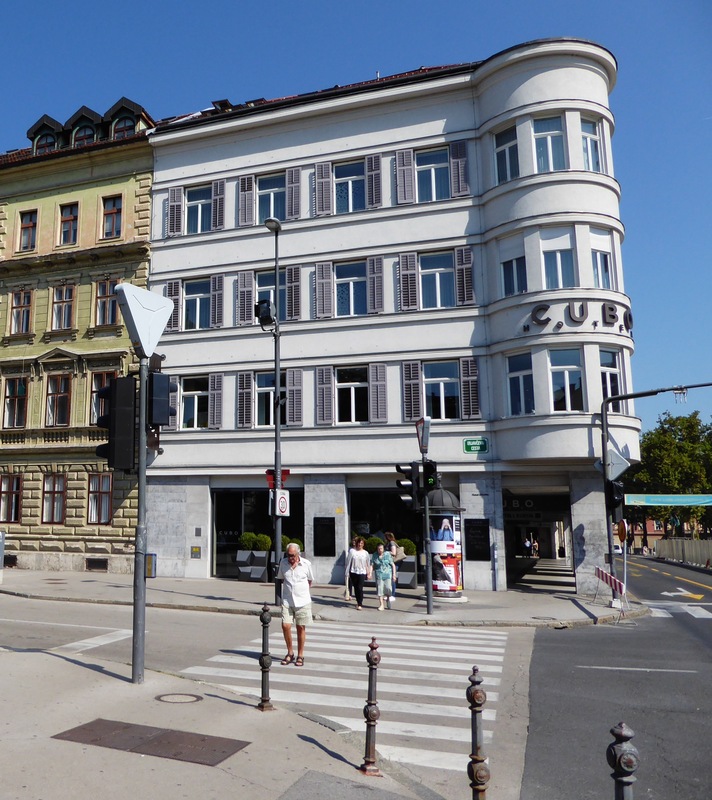 Ljubljana is somewhat like that. It is beautiful in an old worldly manner. On Sunday morning a band was playing in the square, beer was already being served and it was not yet noon. 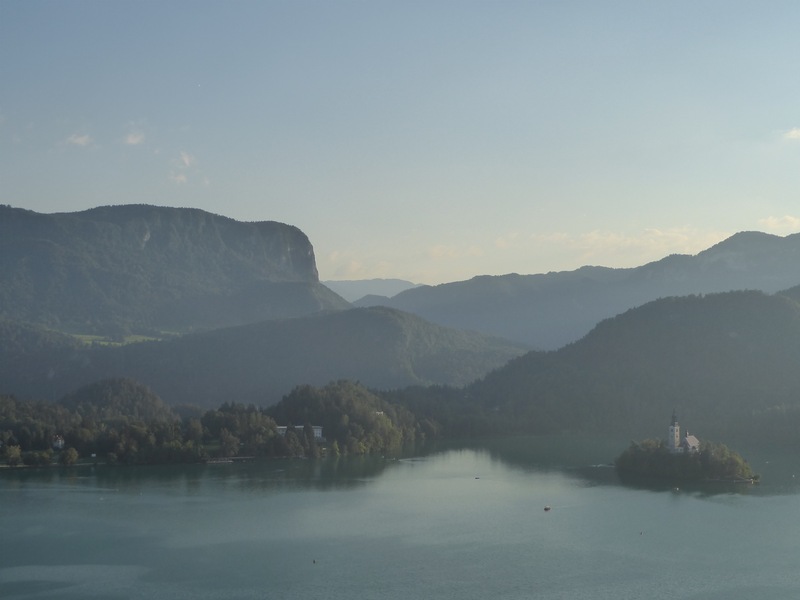 This morning we travelled on to Bled. You look from a hill-top: what a view! Round low hills, tilled and sown to their very tops, are seen in broad undulations; ravines, overgrown with bushes, wind coiling among them; small copses are scattered like oblong islands; from village to village run narrow paths; churches stand out white; between willow-bushes glimmers a little river, in four places dammed by dykes; far off, ina field, in a lne, an old manor-house, with its outhouses, fruit-garden, and threshing floor, huddles close up to a small lake. But, on you go. The hills are smaller and even smaller; there is scarcely a tree to be seen. Here it is at last – the boundless, untrodden steppe! Here there are bream in the lakes, mallards dabbing in the water, and the sun caressing the skin of the lake. It is as if the earth is having a final heave ho before autumn sets in. Splendor and plural riches everywhere. Yes, we too have escaped the forlorn Birmingham dampness and darkness for a few days to bask in the sun, to worship the sun god, Ra, as he travels the sky daily in his boat in order to revere him at his zenith before the days start to draw in. It was now late afternoon. To the West the sun was setting. There was a fine mist, like gauze, settling over the pine forests. The sky was a translucent, unimaginable blue, but now there were clouds, puffed up but sparse. We had walked the third of a mile up 2000 feet to the castle. Up at the summit, the countryside was laid out like a shawl, in varying shades of green, lit up in the dying light. The hills undulating like a wave of battlements keeping the wide horizon from sight. On the way up the hill, there were cyclamen in the undergrowth, purple and shy. But it was the lake that took center stage as we turned and bent in hairpin bends, the evening light everywhere golden. Later at night the full moon had a buttery yellow sheen over it as it fixed its eternal gaze at the lake. The lake was now dense black, polished like a soldier’s boots. The reflected moon only a miniature lamp, a flickering bush lamp in the distance. Tonight we ate at Murka, a traditional Slovene restaurant. Jan had medium roast duck with cabbage and potato rolls in sour cream. I had mixed grill, a bowl of salad. To finish off, espresso and schnapps on the house. Excellent. 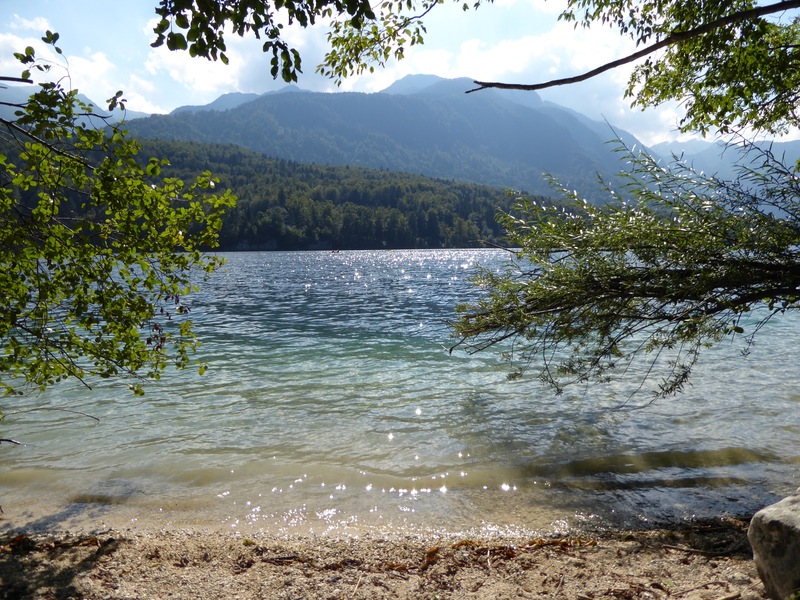 We walked slowly back to our hotel, Triglav, along the lake with the full moon trailing us. Then the bracing trek uphill back to our hotel along a foot path meant for elite athletes well prepared for the Bled triathlon! Argh we survived this test of the cardiovascular system. 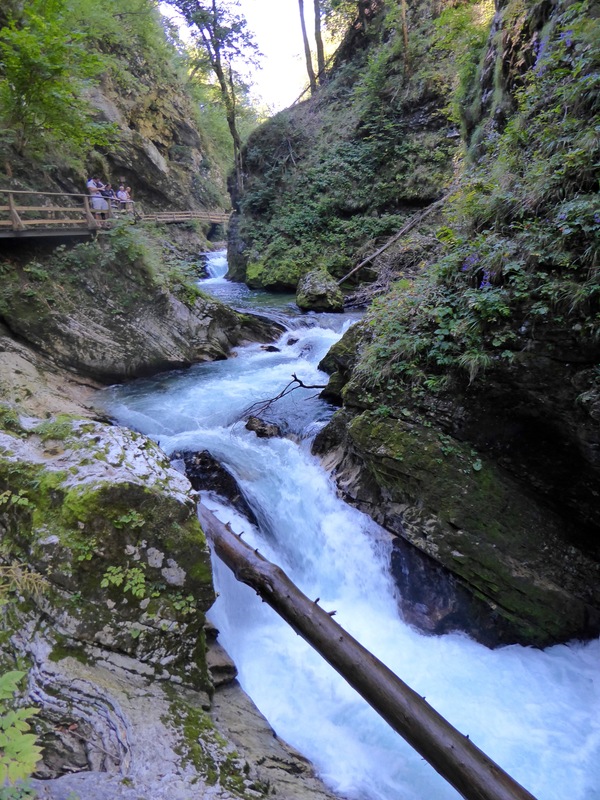 On Monday morning we went, first, to Vintgar gorge, cut by the Radovna river, in between Homs & Börst mountains. The river does what rivers do, twists and turns, falls down, splashes, rushes through gaps and then in the shallows, ambles. Salmon swam upstream, dawdling in the rock pools whilst garnering their strength before leaping past the waterfalls. It was 2 miles in one direction and then back. On either side of the gorge were beech trees. The river was the most limpid you’ve ever seen. In some places, it was clear, in others blue reflecting the sky. The sun danced and shimmered in the eddies. All in all it was breathtaking. Then we drove to Radovljica This sleepy town boasts the most intact Gothic center. It lived up to its boast. It was practically deserted. The Main Street had houses from the 14th century with frescoes. The white-painted church, the courtyards in the bright sunlight, all stood as if time itself had stopped. The surrounding countryside, the fields and the bowl of hills, opened out rather than enclosed the view. 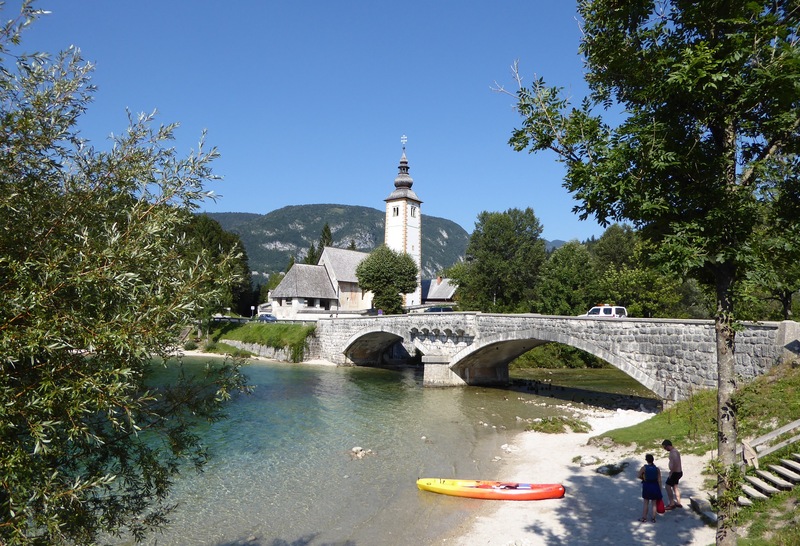 Now for Lake Bohinj, this was a very different lake from Bled. It was narrow and long, twenty miles long. 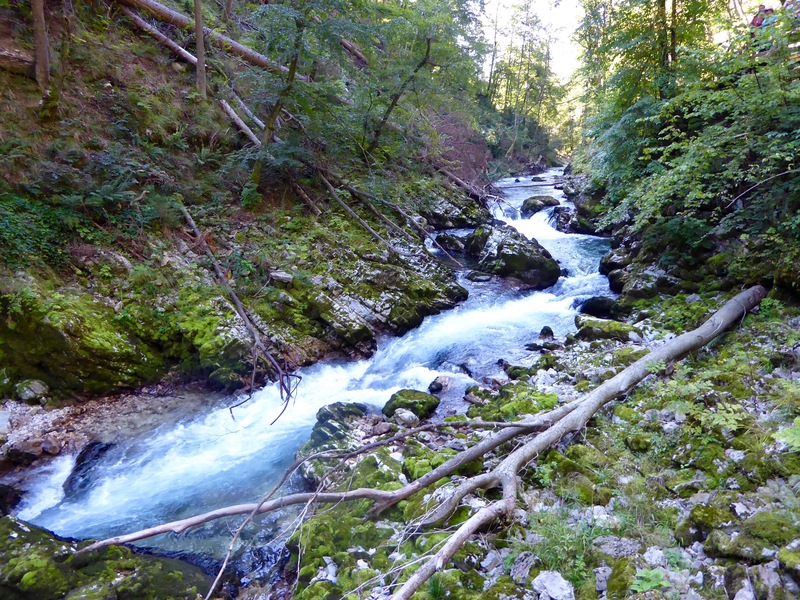 The length fitted into the valley, a cross between a river and a lake. It was aquamarine and emerald in places and it stretched the sight to the converging point of the valley. One end was next to the Church of John the Baptist, which had a fresco of St Christopher on its main wall, with six toes on each foot. Very strange indeed. Inside were frescoes of John the Baptist’s head served on a platter to Salome. There was a crowd of tourists taking photos when we arrived. I sat on a front pew and took in the atmosphere, if you can call looking at gruesome paintings of a dead body bleeding from a headless torso atmospheric, that is! We hadn’t realized that parking was not free. We were charged a fine of thirty Euros. Enough said. The drive back to Ljubljana was uneventful. Tonight we had dinner at a pizza place. Earlier we had walked through Art Deco parts of the city. I take back everything I previously said about the city being tired and fatally exhausted. The entrances were gaudy in the most entrancing manner- tiaras for headdress, facades that sparkled with humor and color. Elegant doorways, porticoes and display windows that simply dazzled with light and design. Our final evening together at Ljubljana was spent at the opera. The Chinese National Opera was performing Puccini’s Turandot, sponsored by the Chinese embassy in Slovenia in celebration of 70 years of the Chinese Revolution. It was a decisively impressive performance made all the more special since Turandot is set in Beijing. There were overtly Chinese aspects to the production: the singers sang facing the audience rather than communicating with one another; there was a stylized quality too; and the costumes were more authentically Oriental. Turandot was only partially completed by Puccini and this was self-evident. The second and third acts were nothing in comparison to the magnificent and rousing first act. And the storyline as in all opera was farfetched and improbable. But it was nonetheless a wonderful evening. We went for a quick drink at a bar 5 minutes from our hotel before retiring for the evening. I had to wake up at 4:40 am to drive to the airport to catch the 7 am plane back to Birmingham. Good one Femus xxxx NB This is my home e mail. 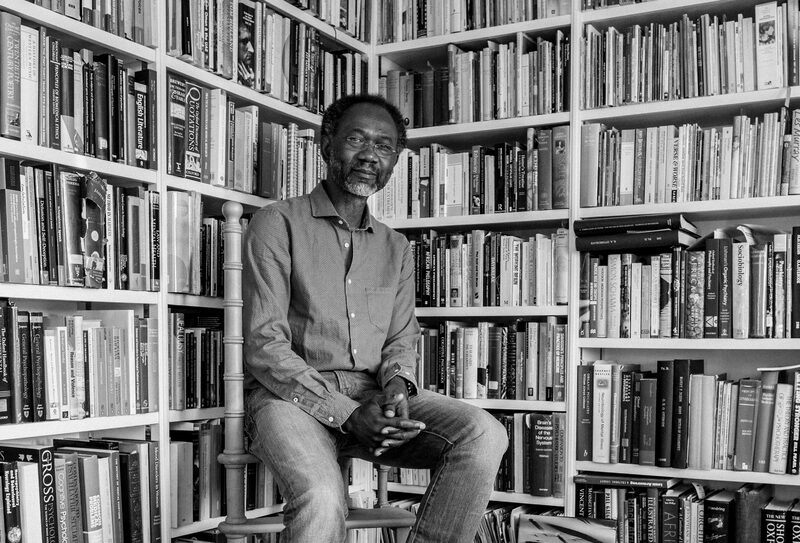 You can contact me re Uni work on j.oyebode@bradford.ac.uk.